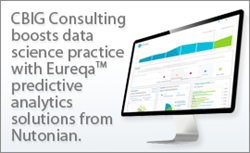 CBIG Consulting expands its data science consulting capabilities with Eureqa™, an advanced technology that uncovers and explains the intrinsic relationships hidden within complex data. This week, CBIG Consulting announced it has bolstered its data science practice by implementing Eureqa™, a pioneering software developed by Cambridge, MA-based Nutonian. CBIG plans to leverage Eureqa to drive predictive – as well as prescriptive – conclusions within finance, life sciences, retail, and utilities markets. Onder said Eureqa has had remarkable success within many business unit applications, from sales forecasting and manufacturing/supply chain optimizations, to claims and risk profiling, to stock trading, and beyond. Eureqa began as research by one of the world’s leading data scientists, Michael Schmidt, Ph.D, within the artificial intelligence laboratory at Cornell University. Schmidt sought to develop a computational approach for understanding complex relationships within biological science and physics, two highly technical fields. Based upon early success, Nutonian was founded to transform the initial prototype into an enterprise suite of products serving not only highly sophisticated users but also analysts within the business intelligence community, said Scott Howser, Senior Vice President of Products and Marketing at Nutonian. “Eureqa demystifies artificial intelligence and machine learning concepts by providing customers with transparent results that explain the key relationships hidden within their complex data, along with guidance of actions to optimize outcomes, directly and automatically from their data,” Howser said. Onder commented that most recently, utilizing Eureqa, a Fortune 100 business achieved sales forecasting output on a per-location basis of more than 93% accuracy, an incredible result for a market that changes week to week. “More importantly, we’ve given them not only the predictive accuracy, but also a path to execution that materially impacts their bottom line, without disrupting the business model—it’s a win for us and every business unit we can affect." CBIG Consulting, a division of Chicago Business Intelligence Group, Inc., is an international team of experts in Data Warehousing, Business Intelligence, Big Data Analytics, and Cloud-based Analytics platforms. Selected in 2013 by independent research firm SourcingLine as well as CIO Review as a leading big data/data analytics consulting firm, CBIG consultants average fifteen years of direct experience in the field. CBIG works with global enterprises, mid-size businesses, and non-profit organizations in solving mission-critical reporting and analytical needs. CBIG is headquartered in the Chicago, IL area, and has additional offices in San Francisco, CA, Boston, MA, Denver, CO, Austin TX, Raleigh, NC, and Sydney, NSW, Australia. For more information, please visit http://www.cbigconsulting.com. Founded in 2011 by two of the world’s leading data scientists, Nutonian has developed a breakthrough technology that enables anyone to uncover and explain the intrinsic relationships hidden within complex data. The ability to not only predict, but easily understand “how things work,” fundamentally changes the way businesses extract value from their data. Over 35,000 analysts, researchers, and engineers worldwide have used Eureqa™ to uncover and explain breakthrough insights in fields ranging from microbiology to material sciences, retail, telecommunications, and satellite communications. For more information, please visit http://www.nutonian.com.